In this post, I'm going to explain you a simple chat box design layout using jquery with css. 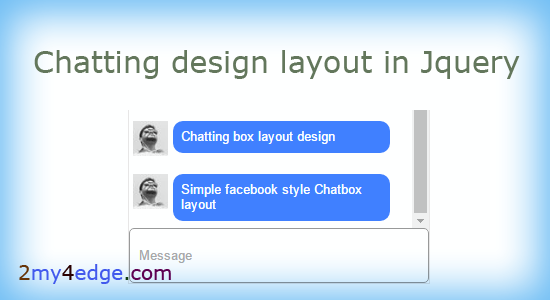 Now a days most of them looking for chat box design, so here i'm going to show you one of the simplest way of chat box design with simple layout. lets see the code below. I hope you can understand this code, If you have any query comment below in comment box. i will reply you. Thank you. Hey Arunkumar, great code! Sometimes you can have all the voice and data cabling infrastructure, but you need to have simple code that loads fast too. Thank you for sharing this script with us. Will be implementing it soon. Maraj monthly kitne chhap lete ho ?